Being prepared for emergencies allows you to enjoy daily life while knowing you are ready if something goes wrong. Hurricanes - Yup. Hurricane Katrina is the worst recent one, but even the minor hurricane that knocked out my electricity for a week left local store shelves pretty empty. Tornadoes - As I write this, the people out in Joplin, Missouri who aren't in the flattened section of town are really struggling to get basic necessities any place closer than two hours from home. Having enough food and water and a few necessities would make things a lot easier. Nuclear disaster - Japan may never be the same. This wasn't a one time fluke. We also have Three Mile Island and Chernobyl. When I was at a local school fair the other day, the health department was manning a table where they promoted disaster preparedness and safety guidelines for our local nuclear power plant. They were even giving out iodine tablets to people who lived within ten miles of the plant. Job loss - Personal tragedies are just as horrible for the person living through them as natural disasters are for the rest of us. When you don't have a job, it sure is nice to know you can at least eat. Illness - I had Lyme disease twice. I don't know how many times I felt super sick during a flare up and felt so glad I didn't have to leave my house to shop for dinner. Nah. I will eat off the land or something if things go wrong. Yup. And it sure is a relief to know I can feed my kids for a few weeks if I can't get to the store. Maybe. Does a can of soup from 1943, a pack of Ramen noodles and a jar of really old dry beans count? Grab an extra item when there is a good sale - This is my favorite way to stockpile for emergencies because it is food you'll really use and it doesn't cost much. You don't have to worry about wasting it because you just use the one that expires soonest and replace it with a new one the next time you go to the store. Buy stuff you like in bulk from Honeyville or somewhere similar - I love Honeyville's 9 grain cereal and I know it won't go to waste if I buy 50 pounds at a time. I also like to have a few of the dehydrated products on hand, but I make sure I don't go overboard. Preserve your garden's bounty - One big reason I don't go overboard on dehydrated food from other places is that I make my own. I grow organic and know how clean everything was when I dehydrated it. I preserve enough to last til the next season. 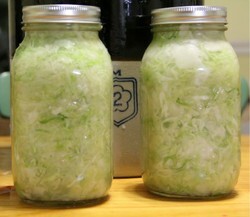 Then, I can preserve fresh food for the next year. Grow it yourself - Some people simply plan to garden in emergencies. However, if a natural disaster is bad enough, you may lose your entire garden that year. Having a stockpile of food from last year's harvest and enough seeds to see you through a failed season and more seeds to still plant your garden again the next year is a wise idea. Kately, some very good tips and practical too. Food storage in the home is always a good idea. Not only can it save money but it can come in very handy when needing to "shelter in place" due to an unforeseen emergency. We just need to keep on top of the expiration dates. Also, don't forget your bug-out bag for those emergencies that may force you out of your home for a few days. Great tips and ideas about having a food supply. After the drastic weather we've seen over the past week in our area this is a very common sense plan. Stockpiling food and fresh water is a must when you have kids especially. Thanks for the helpful guide. You've compiled some great ideas on starting a stockpile - I'm working on growing my own food at the moment. I haven't learned how to preserve anything yet, though. We have some things stockpiled, but we're not nearly as prepared as we should be.